Suggested replacement for the UF system is once a year for all three filters, Carbon, UF Membrane, Mineral Alkaline . If you are using a high volume of water or your water contains a lot of sediment you may need to replace filters more often. If you notice the flow of water decreasing or water not tasting as good as it used to then is probably time to replace your filters. These Filters only fit our NEW #700 Series Systems. 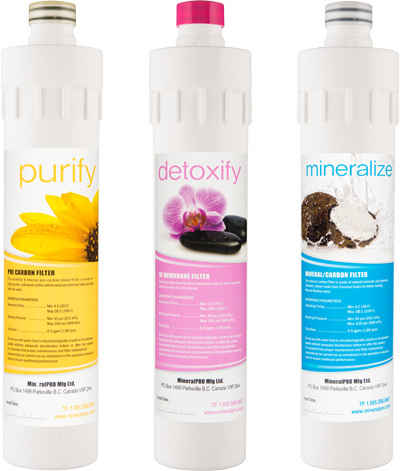 New systems include our new Mineral Filter that has more Mineral Content and produces great tasting Mineral Alkaline water with a higher PH level. Replacements for MineralPRO UF System filters in one simple kit. 1 – 1 Micron Carbon pre-filter. Easy to install, no need to turn off the water. Just a quarter turn. The recommended filter change is every 1350 gallons*.